Shopping for a new central air conditioning system for your home is hard to compare to most other types of shopping. It might not be as stressful as buying a new car, or as expensive, but with a new car there are many different models that would suit you, and personal preference is one of the most important criteria in making a final choice. With an air conditioner, there’s a narrow number of units that will do the job necessary, and choosing the wrong one means a house that isn’t comfortable and utility bills much higher than necessary. You absolutely need a Lake City, FL, HVAC professional to help you to find a central air conditioner for a new installation. Trying to go it alone can end up creating major problems. Finding the right size of new AC is the biggest reason to have an experienced cooling technician to give you a hand. By size we don’t mean the amount of space the air conditioner takes up. (In fact, most residential air conditioners are designed to fit into standard HVAC cabinets and physical size differences are rarely an issue.) What we mean is the cooling output of the AC unit, which is measured in how many BTUs (British Thermal Units) of heat the system can extract from the air. What’s tricky about accurately sizing an air conditioner is that the new unit must have the correct balance between too weak and too powerful. Picking the most powerful AC you can afford is a big mistake! An oversized air conditioner will constantly short-cycle, leading to a system that breaks down years before its time and drives up electrical bills. The way an HVAC professional finds the correct size of AC for installation (“sizing” the unit) is to perform a heat load calculation for your home. This calculation takes numerous factors about your house into account to find out the amount of cooling necessary from the air conditioner to provide you with comfort without energy waste. Another important factor in picking an AC is the energy efficiency rating of the unit. This rating is SEER, and the higher the SEER number, the more efficiently the air conditioner converts electrical power into cooling output. But just like sizing an air conditioner, buying the highest SEER available is not a guarantee of savings or even a unit that works adequately. 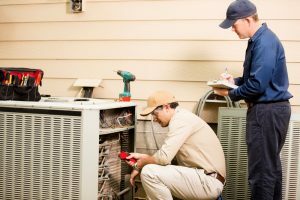 A licensed HVAC technician understands how best to balance the size and efficiency of a new air conditioner so a customer receives the best outcome. If you want better efficiency, the installation technician will make sure you have a unit that delivers on the promise of its SEER rating. After the HVAC expert has picked the ideal new cooling system, you’ll be in great shape for the installation. This is definitely a service to leave to a trained professional—that way your new air conditioner can immediately work the way it should, and keep working for many years. Schedule new AC installation with the best! Touchstone Heating & Air Inc has served the communities of North Central Florida since 1998.